Federal law enforcement has amassed an impressive record identifying and interdicting would-be jihadists bent on waging terrorist attacks before they can acquire the means to kill people. The American military has killed or detained senior terrorist leaders, including those tied to a slew of homegrown terror plots. So when a spike in those plots from 2009 ebbs, those seeking an explanation might start by looking at these documented successes. Not University of North Carolina sociologist Charles Kurzman. In a report issued last week, Kurzman tallied 20 terrorism prosecutions in 2011 as further proof of his theory that the threat of Islamist terrorism is exaggerated and the country's response still rooted more in emotion and fear than reason. The New York Times promoted the report a day before its release, leading with Kurzman's conclusion that, "A feared wave of homegrown terrorism by radicalized Muslim Americans has not materialized." "The public perception of threat does not match actual case-by-case attacks," Kurzman also told the Raleigh News & Observer. "We're getting a skewed perception of the prevalence of these figures." Neither newspaper challenged Kurzman's premise and methodology and neither sought out an opposing viewpoint. For the Times, it is yet another example of its long time collaboration with uncritically and falsely presenting militant Islamist groups and officials as "moderate." But the Kurzman report is flawed by its assumptions and by Kurzman's conclusion that the data shows the threat of radicalization has been repelled, an opinion for which he offers no evidence. He is careful to say there is a threat, noting that "revolutionary Islamist organizations overseas continue to call for Muslim-Americans to engage in violence." But in a Muslim-American population of 2 million, such cases barely register a blip in a country "on track to register 14,000 murders in 2011." Murderers and terrorists both kill. But the comparison ends there. Murders tend to be individual acts, committed for personal or monetary reasons. Terrorist attacks seek mass casualties and seek to instill mass fear to deep economic harm and political surrender. Kurzman authored a book last year detailing his theory. In a question-and-answer posting on his webpage, he explains that if Islamic radicalism were a genuine crisis, "we would see far more than the 20 Muslim-Americans, on average, who engage in terrorist plots each year." Until perspective comes to the debate, he writes, "we may wind up scaring ourselves into panicky policy decisions and a paranoid quality of life." James Carafano, deputy director of the Heritage Foundation's Institute for International Studies, said it was misleading to use raw numbers on an issue like terrorism. Terrorists are "fringe elements of society" whose number never will equate to the damage they can cause. "You could quadruple the number of attacks by Islamic terrorists and it would still be a small number [of the population]," said Carafano, who studied 40 disrupted homegrown terror threats. "Would people say that's not a problem because it is less than 2 percent? No, they would be apoplectic." By defining the problem solely among Muslim Americans, Kurzman can avoid studying some terror financing cases involving foreign nationals. It doesn't matter what a person's passport says. If they are in the United States plotting terror, they are part of the problem. For example, he omits an Islamist man's arrest for plotting to assassinate President Obama after believing it had been sanctioned by the Islamic Movement of Uzbekistan. Ulugbek Kodirov pleaded guilty last week to providing material support to terrorist activity, threatening to kill the president and firearm possession by an illegal alien. And the report makes no mention of Ayman Joumaa, a Lebanese man charged with laundering drug money benefiting Hizballah. In addition, a civil lawsuit filed by the U.S. Attorney in Manhattan alleges that Hizballah laundered hundreds of millions of dollars through a network of drug sales and automobile smuggling from the United States to West Africa, with the money routed through the Lebanese Canadian Bank and other outlets. It's a massive case implicating car lots throughout the country and showing the potential depth Hizballah, an Islamist terrorist organization funded by Iran, has in the United States. And it's completely absent from Kurzman's report. Other statements and postings by Kurzman further call into question his understanding of terrorism and those who support it. Kurzman's website also contains a page showcasing "Islamic Statements Against Terrorism" without comment. Most of the statements condemn the 9/11 attacks. The problem is, many of those cited have repeatedly endorsed other terrorist attacks or are involved in terrorist groups. For example, influential Muslim Brotherhood cleric Yusuf al-Qaradawi is cited for joining in a statement after 9/11 that "All Muslims ought to be united against all those who terrorize the innocents, and those who permit the killing of non-combatants without a justifiable reason. Islam has declared the spilling of blood and the destruction of property as absolute prohibitions until the Day of Judgment." If that was one's only exposure to Qaradawi, he might seem like a moderate voice of peace. But Kurzman's list leaves out messages to the contrary, such as Qaradawi's call for Muslims to acquire nuclear weapons "to terrorize their enemies," his support for suicide bombings targeting Israel, his prayer for the chance to kill a Jew before his death, and his fatwa declaring that those killed fighting American troops in Iraq are martyrs. Other signatories to the anti-terror statement include Hamas founder Ahmed Yassin, and Tunisian Islamist Rachid Ghannouchi – who recently predicted Israel's demise and met with Hamas chief Ismail Haniyeh. Mustafa Mashhur, the fifth head of the Egyptian Muslim Brotherhood, is also cited by Kurzman as being against terror. However, in his book, Jihad is the Way, he stated that there is an "unavoidable personal duty for every Muslim to equip himself and prepare and gear-up towards jihad." Another Kurzman citation, Qazi Hussain Ahmed, former head of the extremist Jamaat-e-Islami Pakistan, claimed it was a jihad to fight American forces in Afghanistan. Kurzman cites a separate statement from Iran's Ayatollah Ali Khameini, despite Iran's long-time support for terrorist groups Hizballah and Hamas, and the Islamic Republic's suspected involvement in terrorist attacks around the world. Some of his other positions have been woefully off base. In 2010, he wrote about the difficulty Islamist parties face in open elections. "When we examined results from parliamentary elections in all Muslim societies, we found a very different pattern: Given the choice, voters tend to go with secular parties, not religious ones." He made similar points during a 2009 lecture at UNC, saying "There's been a lot more Islamic parties competing in parliamentary elections than is generally acknowledged. These parties are generally not wildly popular. The freest elections do not lead to their largest support." Elections in Tunisia and Egypt should trigger a re-examination of that research. In Egypt, Islamists swept more the three-fourths of parliamentary elections and are poised to write the country's first constitution since Hosni Mubarak's ouster. Tunisians gave Islamists a strong plurality. And his statements overlook the sweeping parliamentary victory by Hamas during 2006 elections over the secular Fatah movement. At the heart of Kurzman's work is a belief that counter-terror debate and policy are driven by emotion. On his website, he writes, "I am trying to refrain from offering specific policy changes at this point — I am focusing for now on helping to tone down public paranoia enough that we can have a sensible, evidence-based debate about what policy changes might be appropriate." His research is published by the Triangle Center on Terrorism and Homeland Security, (TCTHS) a collaborative effort between Duke University, the University of North Carolina at Chapel Hill and RTI International. RTI, the Research Triangle Institute, is a non-profit research center that works with academia and the government. A subsidiary, the Institute for Homeland Security Solutions (IHSS), has received nearly $10 million from the Department of Homeland Security through a contract initiated in 2008. Triangle Center Director David Schanzer also serves as the IHSS director for strategy and outreach. Schanzer and Kurzman are in lockstep when it comes to their terror research. "We have to put it in context," Schanzer told the Raleigh newspaper. "This is a real threat, but it's a diminishing one." Those charged with protecting Americans from attack, and presumably those privy to intelligence about terror threats, seem to draw no similar comfort. Director of National Intelligence James Clapper, who follows Obama administration policy by refusing to refer to Islamist extremism, choosing instead to describe "homegrown violent extremism," told the Senate Intelligence Committee on Jan. 31 that the threat remains pervasive. Homegrown radicals "are constrained tactically by a difficult operating environment in the United States," he said, but he warned the threat from would-be jihadists "may be evolving" based on past failures into "an increased willingness to consider less sophisticated attacks." In addition, tension with Iran could make the Islamic Republic "more willing to conduct an attack in the United States in response to real or perceived US actions that threaten the regime." A disrupted Iranian plot to kill the Saudi ambassador in Washington by making the hit look like an al-Qaida attack is evidence of this new attitude, Clapper said in his written remarks. Later that week, ABC News reported that Jewish and Israeli facilities in the United States are on high alert, and receiving extra attention from law enforcement, out of concern more Iranian plots could be under way. The plot against the Saudi ambassador involved a bombing. The ABC report quoted an unnamed federal official who said the lack of concern over collateral damage by Iran "was an eye-opener." Kurzman's report, meanwhile, grossly mischaracterizes one of the cases he lists. He described Emerson Begolly as "a 21-year-old former white supremacist who converted to Islam and posted violent-sounding material on the Internet. When his mother tricked him into meeting with FBI agents outside a fast-food restaurant, he got into a tussle and bit them." The biting episode did prompt the initial charge against Begolly, but his August guilty plea for soliciting violence made clear that he sought far greater bloodshed through a jihadist website. He urged jihadists to attack government buildings, Jewish schools and daycare centers, transportation targets and utilities. "No peace," he wrote in July 2010. "But bullets, bombs and martyrdom operations." In a statement issued after Begolly's guilty plea, U.S. Attorney David Hickton praised agents who were able to stop a brewing threat before "a perpetrator commits actions ending in tragedy." Kurzman does talk about terror financing cases in this report, but does not include them in his chart of terror cases. We noted this when we wrote about his previous report in 2010. Then, he explained terror financing didn't count because those cases are for "exclusively non-violent activities … because, in our view, individuals have not fully radicalized unless they are willing and have taken steps toward violent action to further their radical views." When U.S. Rep. Peter King, R-N.Y., criticized the omission on CBS, Kurzman issued a rebuttal revising history. In 2010, terror financiers weren't counted because they weren't fully radicalized. In response to King, he said he didn't have the money to study it. "This decision," he wrote, "was not politically motivated. Given limited resources, the study focused only on violent plots. I would be pleased to do a comparable study of terrorist financing cases if research funding is made available." Kurzman's latest report discusses terror financing prosecutions for the first time, but he does not include them in his grid of terror arrests. "The number of Muslim-Americans indicted for support for terrorism is more than double the number indicted for violent plots – perhaps not surprising, since it would appear to be far less of a commitment to engage in financing than to engage in violence," Kurzman writes. "Nonetheless, this finding underscores the relatively low level of radicalization among Muslim-Americans." To claim material support doesn't count as terrorism because the perpetrators are not ready to plant a bomb is like saying a money launderer in an organized crime syndicate is not a gangster because he doesn't mule dope, run a brothel, break the legs of recalcitrant shake-down victims or personally murder the opposition. The money mover facilitates what the dirtier hands do, even if he looks somewhat cleaner. Kurzman also makes a point that there were no new cases of Somali terrorism in 2011. By focusing solely on prosecutions, he avoids having to explain what motivated more than two dozen young Muslims to leave their homes in the Minneapolis area to join the Somali terrorist group al-Shabaab. Several of them have died in attacks, including at least one who killed himself in a June suicide bombing attack on African Union peacekeepers. In the first House hearing on radicalization among Muslim-Americans, the uncle of another man who died in Somalia testified about the resistance he met from the organized Muslim community when he sounded the alarm and cooperated with law enforcement. Abdirizak Bihi called the reaction by the Council on American Relations "a slap in the face for the Somali American Muslim mothers who were knocking on doors day and night with pictures of their missing children and asking for the community to talk to law enforcement about what they know of the missing kids." Aggressive law enforcement helped stem the flow of money and men from Minnesota to Somalia. Kurzman cites past case volume, but only to accentuate the point that there were none in 2011 rather than credit the success. Kurzman's reports share a practice of using data to promote advocacy for a political agenda. That technique allows him to ignore law enforcement and military successes in stemming the growth of Islamist terrorist plots hatched at home and abroad and argue instead that the problem is overblown. That this is underwritten by federal research grants makes even less sense, and should be re-evaluated immediately. 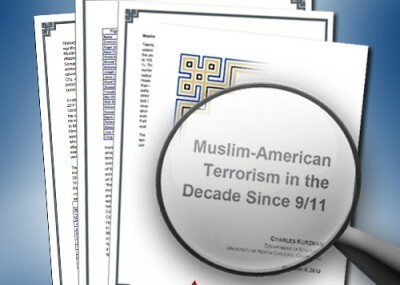 We appreciate the attention that Steven Emerson has paid to the Triangle Center on Terrorism and Homeland Security's recent report "Muslim-American Terrorism in the Decade Since 9/11" but are unconvinced by his critique. His main claim is that the report is somehow "ignoring" or undervaluing law enforcement success in thwarting planned attacks in the United States but he points to no text or data from the report that does anything of the sort. In fact, this and the other two reports in the series document and quantify these law enforcement successes and use the data on arrests and prosecutions to better understand the magnitude and nature of the threat of homegrown terrorism. Strangely, Emerson seems agitated by our effort to bring facts to bear when looking at this issue, arguing that it is somehow "misleading to use raw numbers on an issue like terrorism." Really? Is terrorism so emotionally laden and sensitive that it is the only public policy matter on the national agenda that should be immune from rigorous, data-based analysis? We don't think so. Perhaps Emerson opposes this type of analysis because it threatens his one-sided approach to terrorism, which avoids asking questions like: How big is the threat? Is it increasing or decreasing? What are the capability levels and characteristics of perpetrators? Rather, Emerson and other pundits of his ilk presume the presence of a constant, large-scale, highly dangerous threat emanating from the Muslim-American community, and then highlight the most inflammatory statements and incidents by Muslim-Americans to drive public opinion to their own preconceived notion of the truth. We have no qualm with neutral reporting on homegrown terrorism, and our public statements have always underscored that the serious, ongoing threat that must addressed by law enforcement and other governmental authorities. But the notion that our report is pushing an agenda by gathering and analyzing data – compared to Mr. Emerson's propaganda activities – is nonsense. ** The number of violent homegrown incidents by Muslim-Americans has declined two years in a row. Does this mean that the threat is gone or will continue to fade? Of course not. But it does mean that predictions of an inexorable increase in the magnitude of this phenomenon, made by many terrorism experts and government officials, have been incorrect so far. ** The number of terrorism financing cases has dropped dramatically over the past decade, as has the amount of money at stake in these cases. ** A smaller portion of Muslim-Americans who engaged in violent criminal acts in 2011 had connections with outside terrorist organizations than in prior years. A few of Emerson's other points merit a response. First, he criticizes our comparison between the number of murders in the United States in 2011 (over 14,000) with the number of deaths caused by Muslim-American terrorists (zero). Emerson claims this is a false comparison because murderers generally act for personal or monetary reasons and terrorists "seek mass causalities and seek to instill mass fear to deep economic harm and political surrender." Scholarship shows, however, that terrorists have many complex motivations – sometimes acting out of revenge, the desire to connect with a group of likeminded individuals or other grievances. Emerson's claim that all terrorists have macro-level political ambitions (and therefore present a danger greater than the actual violence they cause) is simply wrong. Many of them are just stupid, violent people . Emerson also ignores that the level of the threat depends on both the intentions and the capabilities of the perpetrator. The rag-tag group of individuals arrested in 2011 makes one wonder if any of them (with the possible exception of the alleged Iranian plotter) had the technical capability to cause "mass casualties." Since the terrorist perpetrators in 2011 appear to be incapable of both large scale violence or shaking our national confidence, we believe it helps the public to better understand the magnitude of the threat by pointing out the actual number of deaths they caused in 2011 (none) compared to the approximately 40 killings that take place in the United States every day. Emerson uses his usual distortive techniques with respect to one of the 2011 cases included in our recent report, chiding us for downplaying the dangers of Emerson Begolly, who was convicted for posting violent materials to his website. Emerson cites Begolly's inflammatory statements on his website as indicative of his dangerousness, claiming that Begolly "sought far greater bloodshed" and "urged jihadists to attack government buildings, Jewish schools, [and] daycare centers." We are pleased that Begolly is behind bars and support the FBI's actions that led to the conviction. But there is nothing in the indictment or guilty plea suggesting that Begolly had taken any concrete actions towards terrorist activity -- his criminal activities amount to no more than compiling and distributing much of the jihadi invective that is prevalent across the internet. A crime – sure – but hardly evidence of an organized homegrown movement to "instill mass fear to deep economic harm and political surrender." Finally, Emerson criticizes our separate treatment of violent plots and nonviolent support for terrorism. This report contains a decade's worth of data on both categories, and breaks them down to distinguish between individuals who are willing to maim and murder civilians and individuals who simply finance or provide other forms of support to terrorist organizations. This latter group of perpetrators – while criminals and deserving of punishment – do not present the same level of national security threat as the violent plotters. Emerson is certainly entitled to his view that all terrorists are the same and present equivalent levels of threat, but this is representative of his rudimentary and not particularly illuminating approach to the entire subject. Moreover, Emerson is simply wrong in his claim that we are disregarding cases of material support to terrorism – there are dozens of cases involving material support in both databases.